Here at Locate a Locum, we are all about cutting down on your admin and maximising your time. That’s why we’re always coming up with brand new features - just like this one. 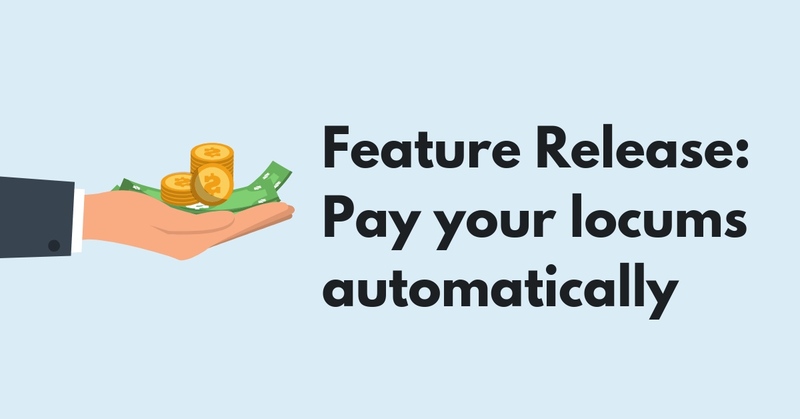 With our new automatic payment feature, we’re making it even easier to pay your locums. Previously, you would have had to keep track of all of your pending shifts and approve them for payment one by one - meaning that your locums could possibly be waiting to be paid until you are able to approve it and separately send their payment to be processed. Now, they don’t have to wait. We’ve created a brand new feature which allows you to approve a shift for payment with just one click, employer added expenses are then pre-approved to speed up the process. Your approved shifts and expenses are then sent out for payment automatically in a weekly Bacs run. This means that locums can now be paid faster and you can easily keep track of what’s being paid out each week, without waiting on manual processing from your accounts team. Don’t worry about losing track of what you have been spending. You can see just how much money will be paid in your Bacs run each week and if you want to look back at your spending, you can just flick to the Paid tab. This will show you your complete history of payments - how much, who to and everything else. Not on Locate a Locum yet? Download from the Apple store or Google play store today.